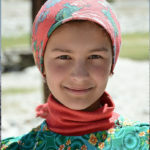 Many of you may recall back in Tajikistan Blog #8, we had met this amazing young girl. 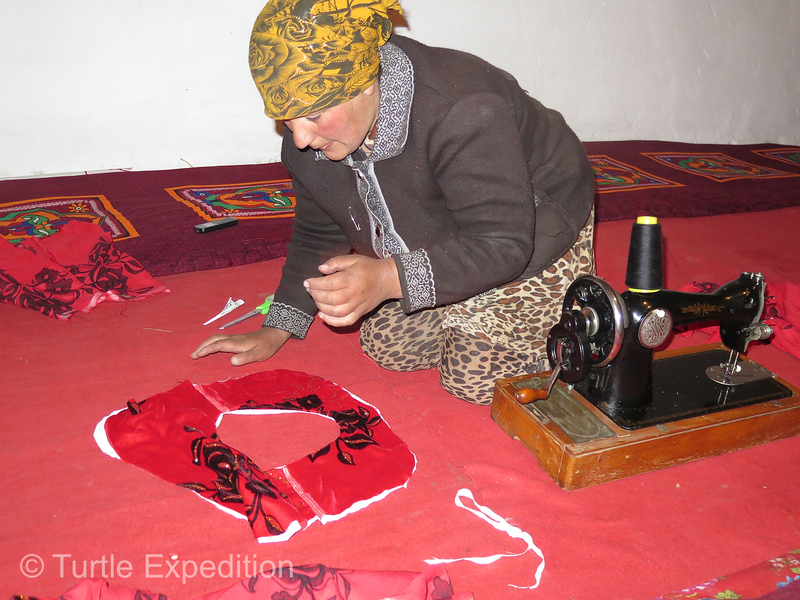 If not or if so, here is an update on the Magic Girl of the Pamirs. 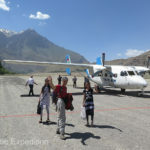 It was another spectacular warm sunny day in the mountains of Tajikistan,— as warm as it gets at 14,000 feet. The intense blue sky almost hurt our eyes. We could feel why this is often called “The Roof of the World”, according to National Geographic “one of the last truly isolated places on earth”. Glaciers carved their way down peaks over 24,000 feet. 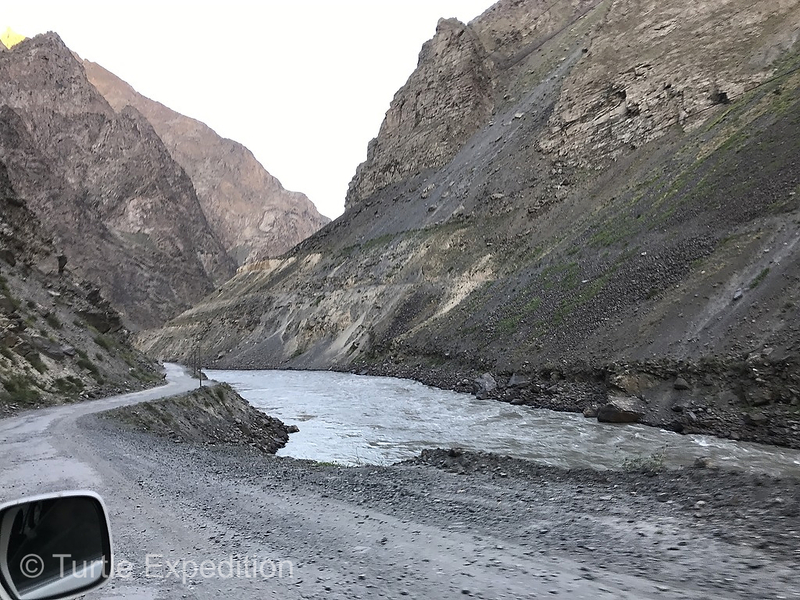 Turning off the Wakhan Corridor along the Afghan border, once trodden by Marco Polo as he followed The Silk Road, we climbed over the 4,122-meter, (13,523 feet), Koitezek Pass and headed slowly down into a long valley following the turbulent Toguzbulok River. 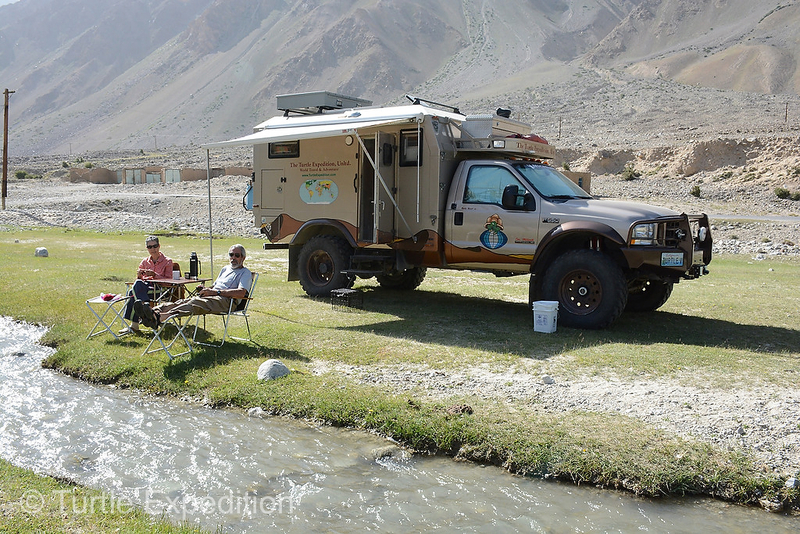 The dusty Pamir Highway was equally as rough in places as the Wakhan Corridor had been. We looked at this young girl in amazement. What in the world was she thinking…. At an altitude of 10,000 feet, potatoes, carrots and wheat are the only crops that are being grown. No fruit trees and no vegetable patches. Wild bees but no honey bees survive. 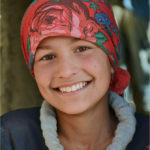 We were captivated by this young girl, only 11 years old. We camped there for three days and met her family who invited us for tea. Each time we saw her and those mysterious Asian eyes, always discreetly catching ours, we could sense her uncomplicated imagination fueled by her burning desire to communicate. Was it her innocent confidence that shyly said. “No fear”—Bring it on!”? Without a single word spoken, she had captured our attention and our hearts. How could we help her? 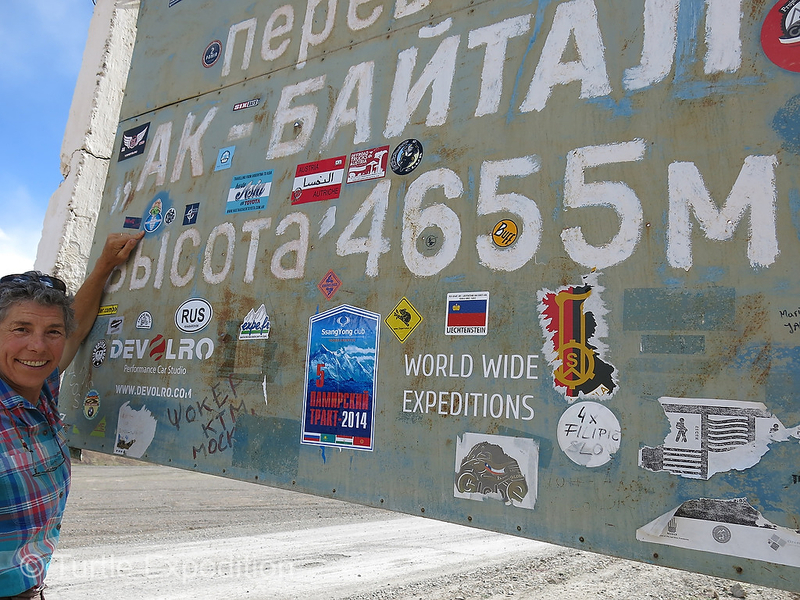 Fast forward a year through Kyrgyzstan, China, Mongolia, Russia, South Korea, Japan and back to California. 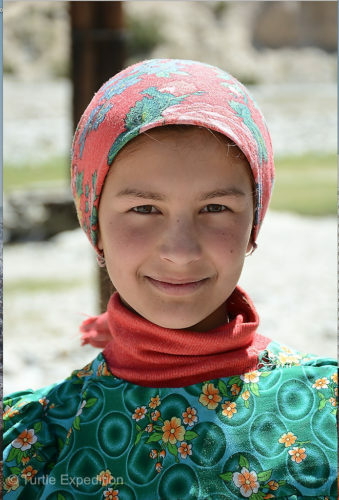 Every time we looked at the pictures we had of this “Magic Girl of the Pamirs”, the feeling came back. 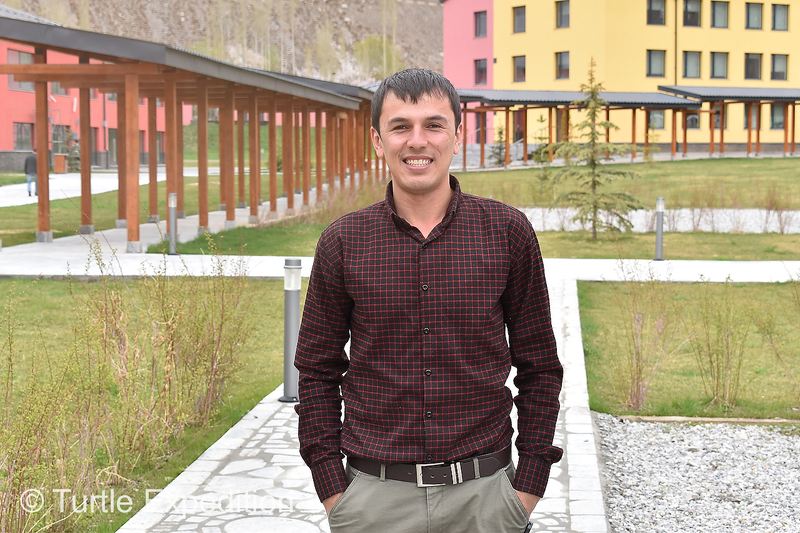 Through a series of emails, we were able to contact a young man, Sheroz Naimov, the Director of the American Corner, in Khorog. 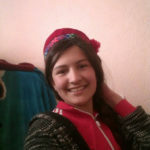 The American Corner is a free learning center sponsored by the American Embassy designed to promote mutual understanding between the United States and Tajikistan and offer a place for young children and adults wanting to learn or improve their English. 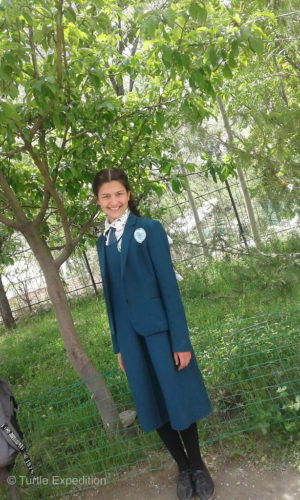 Masha’s father was in disbelief when he learned that we wanted to sponsor his daughter in a special private school. 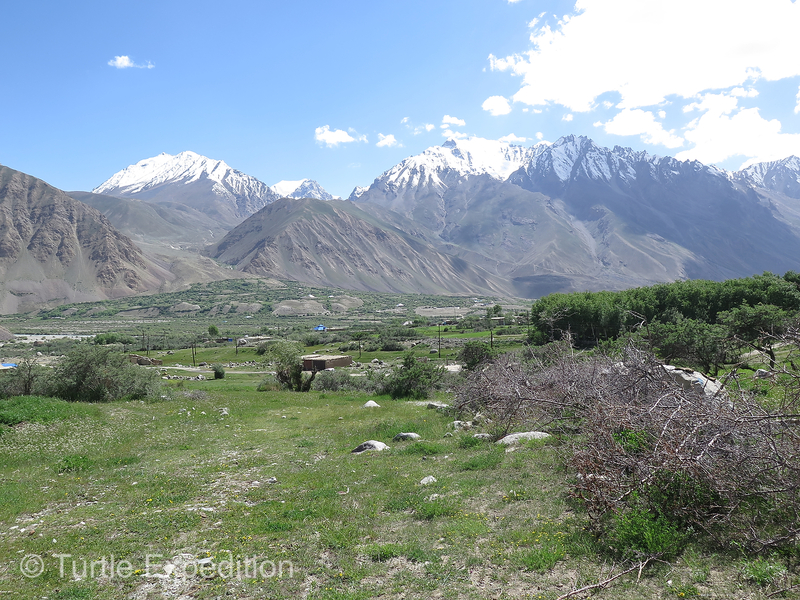 Khorog is a small town, hardly a city, and the capital of the Gorno-Badakhshan Autonomous Region (GBAO). 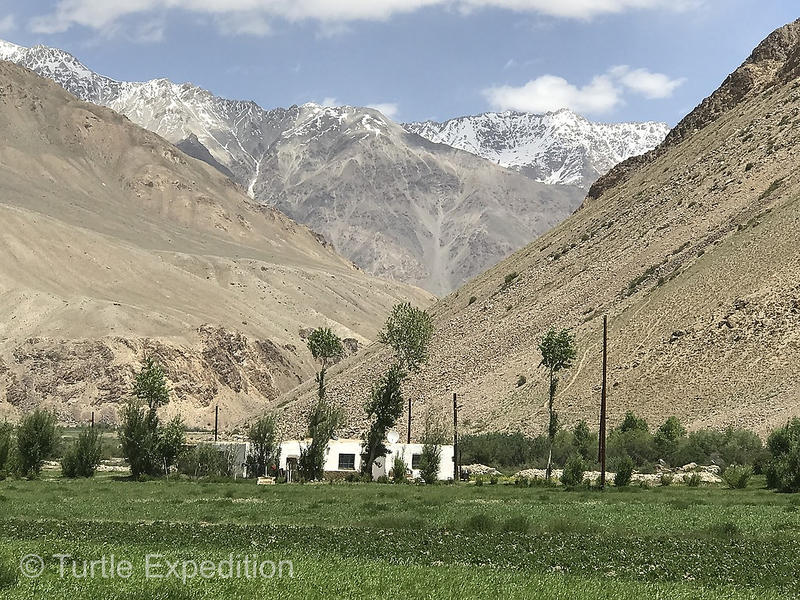 Situated in a valley at the confluence of the Gunt and the Panj rivers, at 7,217 feet above sea level, it is relatively low when you consider that 50% of the country is over 10,400 feet. 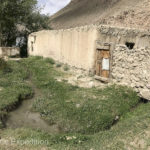 Khorog was at least three hours from the village where Masha lived on a road that can be closed by snow or rock falls at any time. We had driven it twice. 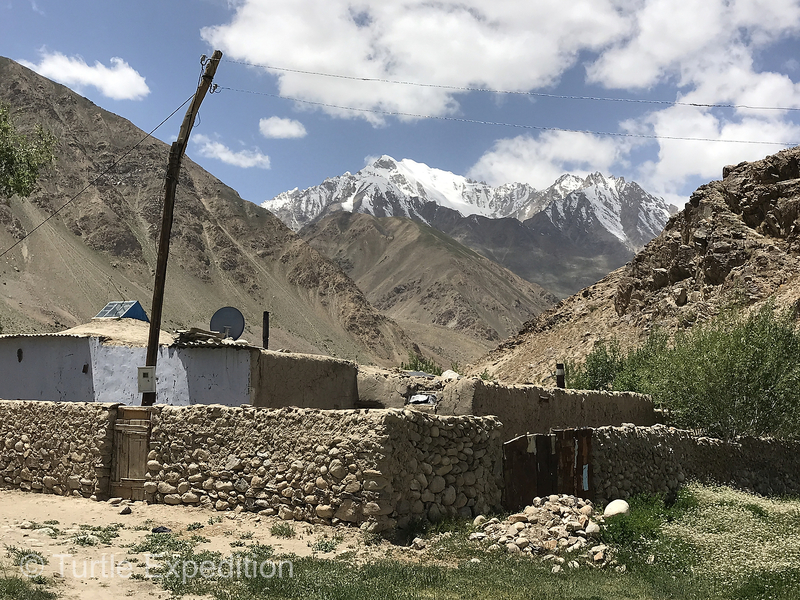 We had learned there was a wonderful private prestigious school in Khorog sponsored by the Aga Khan Development Network, (AKDN). What is that? His Highness, Prince Karim Aga Khan IV, is the founder and chairman of AKDN and is the 49th hereditary Imam (Spiritual Leader) of the Shia Ismaili, a very unique and liberal sect of the Muslim religion. For example, those of the Shia Ismaili faith have no mosques or minarets. Their home is their church. 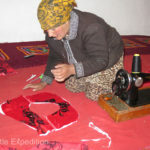 The women are not required to cover their heads or faces, but many do use a headscarf out of practicality and old tradition. 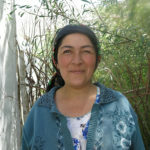 Masha’s mother, a soft spoken woman, always had a ready smile. 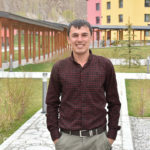 Sheroz Naimov volunteered to help us. Hitching a ride with a friend to the girl’s village, he spoke to her and her father and explained that we wanted to sponsor her in the Aga Khan Lycée school. Sheroz told us Masha had tears in her eyes. 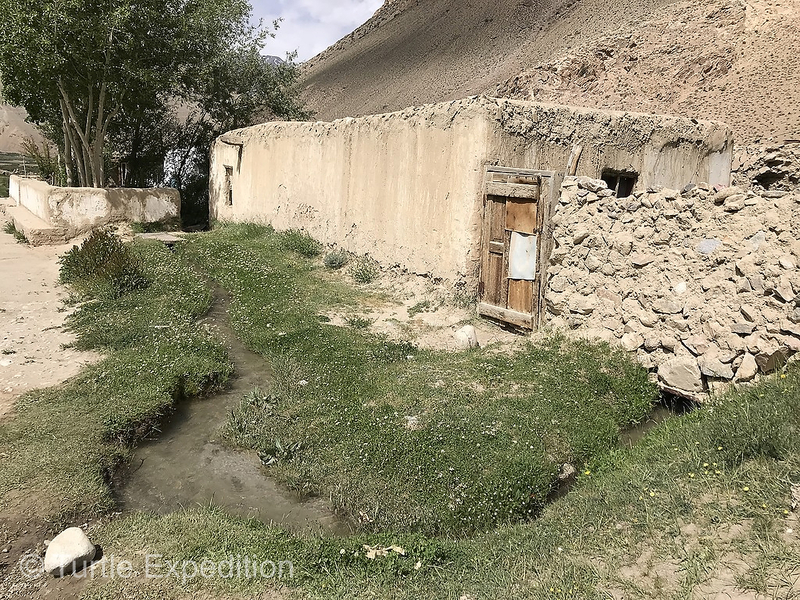 Her father called Sheroz the next day to ask in wonder, “Is this really going to happen?” Yes, Sheroz told him, but now the first problem would be finding a safe place for her to live in Khorog. Secondly, could she pass the entrance test with her very poor math and Russian? 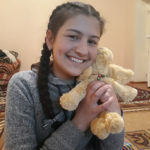 Searching for a home where she could safely live most of the year while she was at school, Sheroz’s father and his sister both opened their homes and their hearts to her. 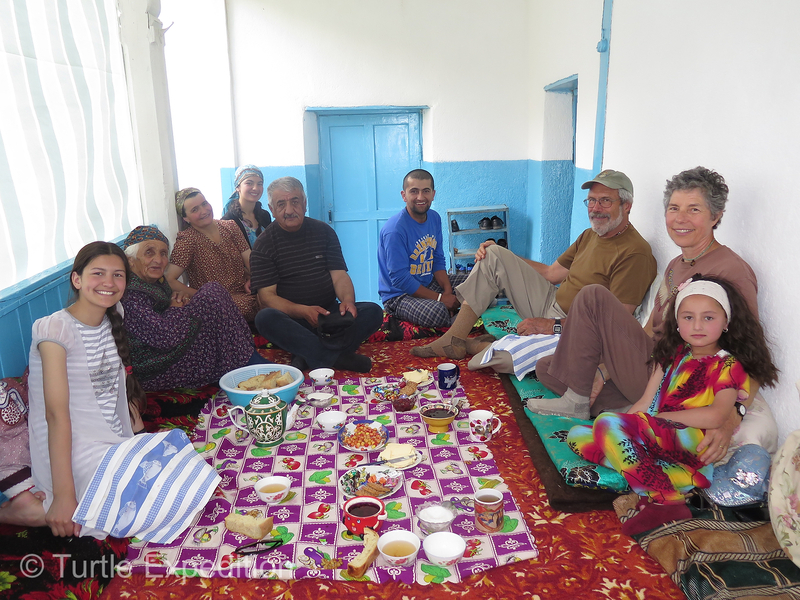 Extreme generosity and hospitality are a corner stone of the Shia Ismaili faith. 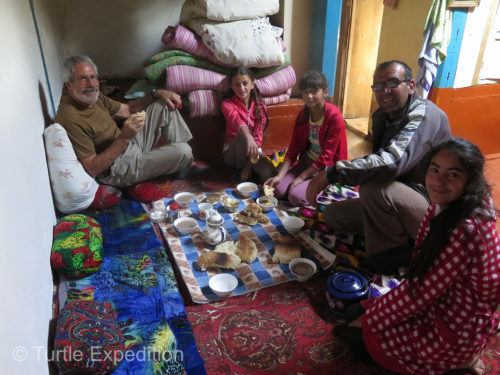 The amazing warmth of these people whom had never met us nor this young girl truly astounded us. 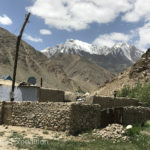 Problem number two was that because of Masha’s limited schooling in math and Russia, she could not pass the Aga Khan Lycée school’s entrance test. After three months of intense tutoring, she made the grade. Now the story gets more exciting. Monika explained a page out of our world atlas, probably pointing out California but Masha and her younger sister had eyes for the camera. She was 12 and nearing 13. We supplied her with a phone so she could call her mother and father. Of course, she had to have a computer and printer and appropriate “city” clothes for four seasons. Sheroz arranged a modem and internet for her so she could Skype and WhatsApp with us. 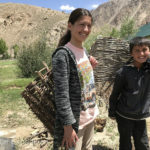 In the beginning, Sheroz had to translate for her, but her magic smile and the sparkle in her eyes told us she was making the transition from a remote village life, away from her home, her family and friends, where daily chores included gathering firewood and milking goats, to being a modern teenage girl in a “city” environment. Hard to imagine? Perhaps it was that No Fear! attitude we sensed from our first contact. We recently celebrated her 15th birthday with her new school friends and family live on Skype, amazing when you consider that Khorog is 7,525 miles, (12,110 km) and 12 time zones away. She is essentially in her sophomore year of high school and taking 17 classes 6 days a week with special English and math tutoring after school before she takes a local taxi to her home-away-from-home to do her homework and help with household chores, including cooking. 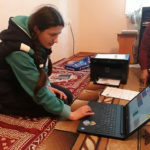 When we first realized that our dream of helping Masha was actually possible, we wrote her a letter to have Sheroz translate. I said “smile” and Monika did. Masha could not understand a word, but her face said, Wow! I am happy you found me”. You are about to start a new and exciting part of your life. We know you must be a little anxious with all the changes that are happening. The doors to the world are opening for you. You will need to study very hard. Sometimes it will be difficult. We want you to know that you can do anything you can imagine. Anything! You can be a doctor, a nurse, a teacher, a ballerina, a musician, a professional guide, an airline pilot. Yes really, the sky is the limit. We just want to make sure you know that you have a huge team behind you if you have a problem. You have us here in California. You have Sheroz and his family. You have the American Corner. You have your mother and your father and your sisters and brother. All of these people are standing behind you to catch you if you stumble or fall. You might find this hard to believe, but because of the Internet, there are also thousands of people all over the world right now who know about you and what you’re about to do. They saw your smile the day that you jumped into the water in the creek by your home to help us wash our truck, and they know that you will succeed in anything you can imagine. You are very special and you have amazing power. Have fun and don’t worry. We send you our love and support. Soon we may even be able to talk with you and with Sheroz on an amazing system called Skype. 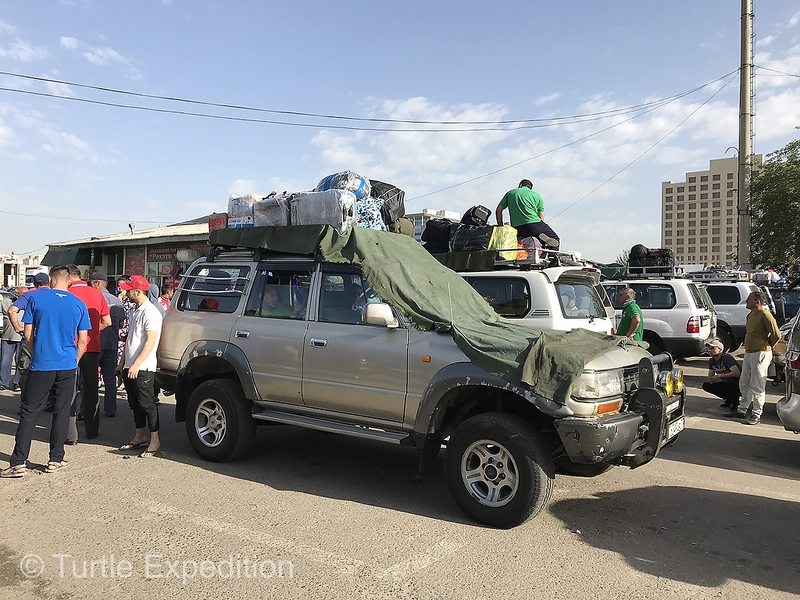 This past Summer we journeyed to Tajikistan to visit her and her family, a grueling 26-hour hop from Sacramento to San Francisco to Istanbul to Dushanbe (the capital) and then a 14 hour drive in a 4X4 Toyota to Khorog—still three hours by 4X4 to her village. The trip was a real eye opener. 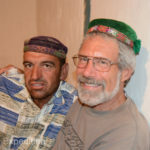 It is a unique way of life for the people in the Pamir Mountains who have survived in this remote part of the world for hundreds of years. 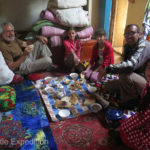 Spending three days at her home made us realize just how poor her large family is. There were conditions we were not truly aware of when we were invited for chai in 2014. 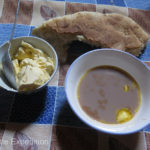 The traditional morning breakfast in the Pamirs is black milk tea with a touch of butter and homemade bread. They had no running water. All washing, dishes, brushing of teeth etc. 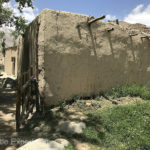 was done in the irrigation ditch, conveniently located in front of their traditional Pamiri home. The ditch took its water from the river where cows, sheep and goats grazed. Cooking was done on an old metal wood fired stove. Water for tea was boiled on an antique hotplate that resembled a burner on a 1950’s electric stove. 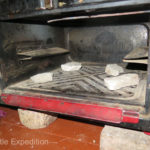 Bread was baked daily in a dilapidated, rickety Russian electric oven. 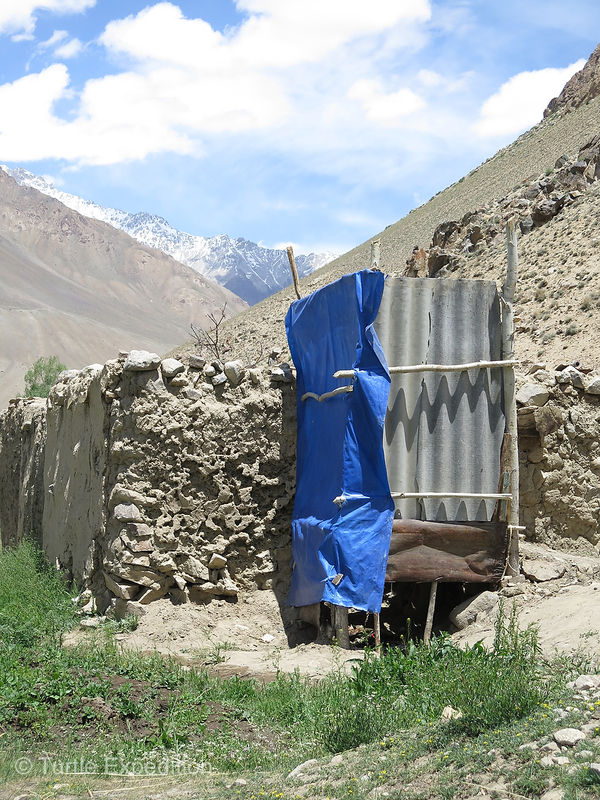 Sanitation facilities were a bit shocking. 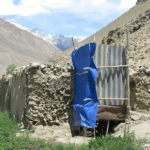 The “outhouse”, located on a steep path up a hill behind the cow & goat shed, was something out of a Li’l Abner cartoon. 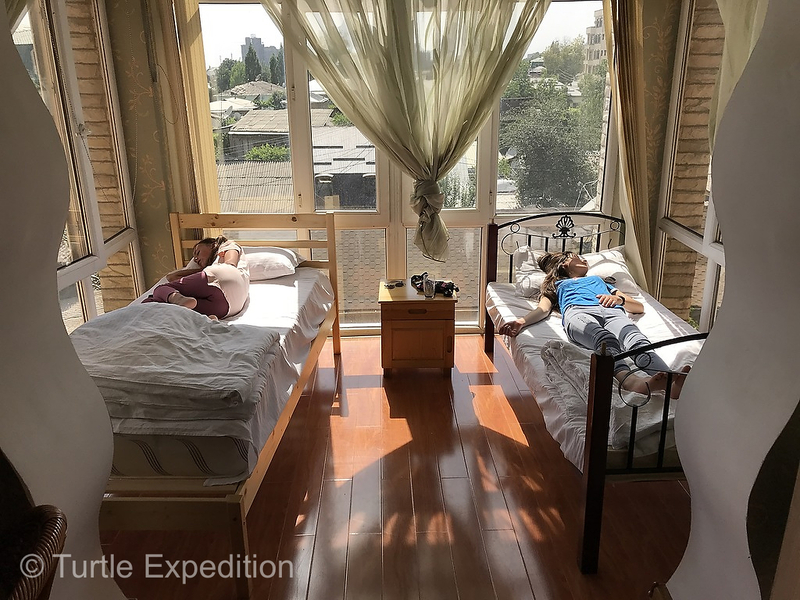 As is the norm, we all slept on thin mattresses in a communal living room where all meals were served and where any social activities took place. No tables or chairs. 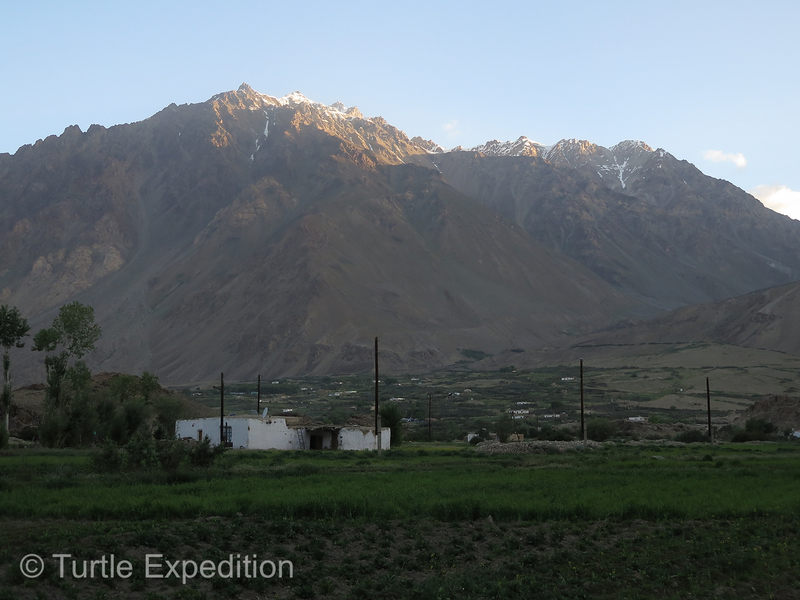 Despite these seemingly harsh living conditions, everyone was extremely friendly and hospitable. 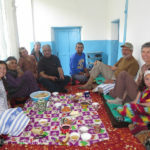 We had experienced the same in yurts in Tuva, Central Russia. 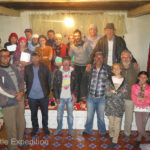 We brought gifts for the family and fruit, rice, chicken, eggs and vegetables to contribute to the meals. 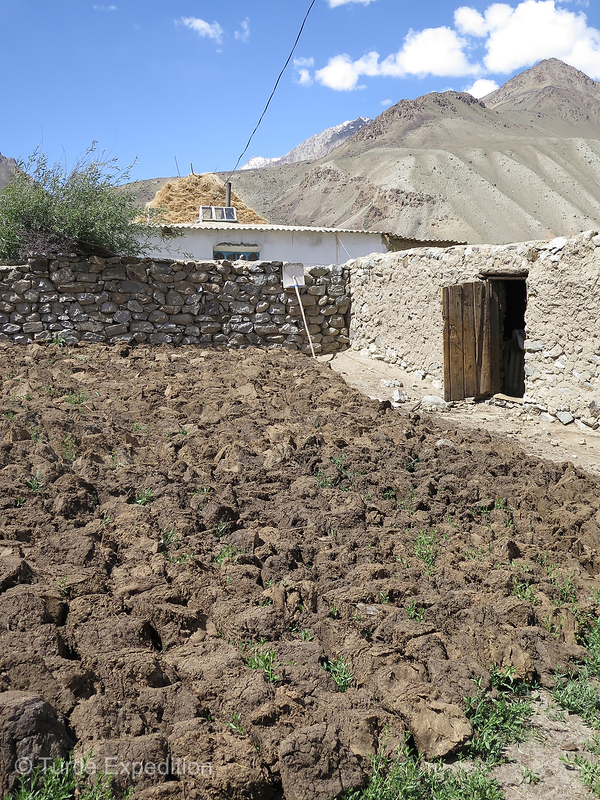 At 10,000 feet, their crops are limited to potatoes, carrots and wheat. Bread, tea, and potato, carrot & onion soup with a bone or a piece of meat from a recently killed sheep gave it some flavor. The community is not really a village as we imagined. 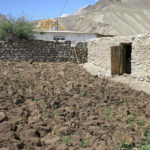 It consists of perhaps 15 or 20 homes spread out across a wide valley, in-between potato and carrot fields laced with a web of small interconnected irrigation channels. 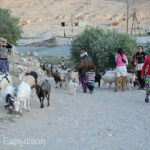 Many of the families are related, so when a sheep or goat is slaughtered, the meat goes to many homes. Ready for school in her winter uniform, she looks quite professional. At this altitude, winters are brutal. Animals must be kept in closed sheds because packs of wolves are a problem. 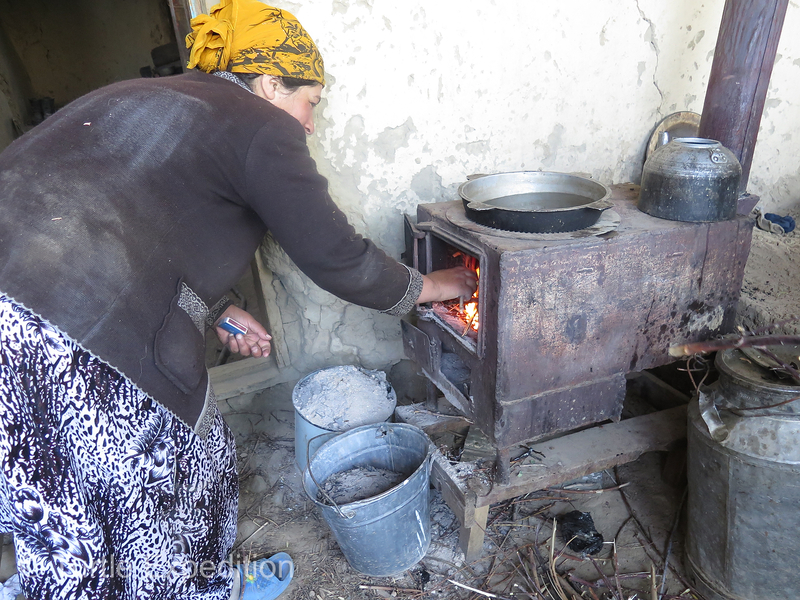 Wood, gathered during the short summer, and dried cow and sheep dung are the family’s main source of heat. 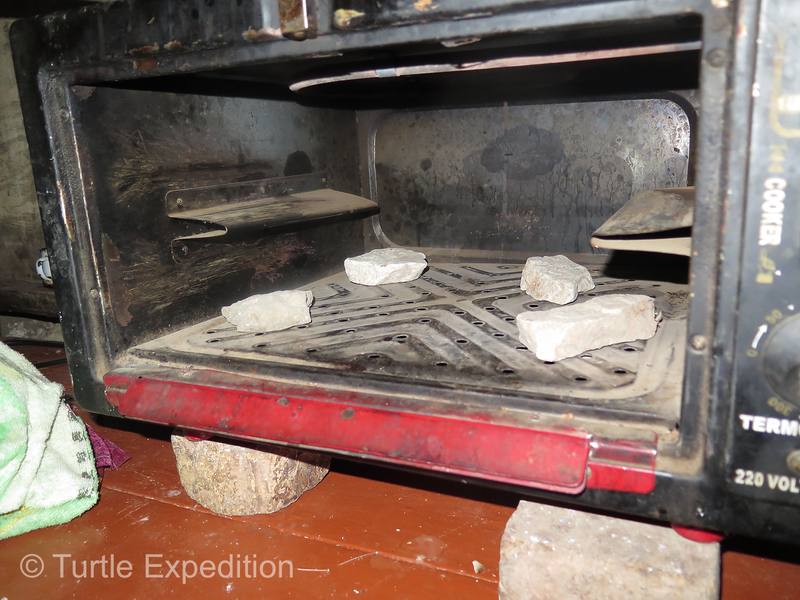 The small sheet-metal cooking stove is moved inside the main room as the temperatures drop. 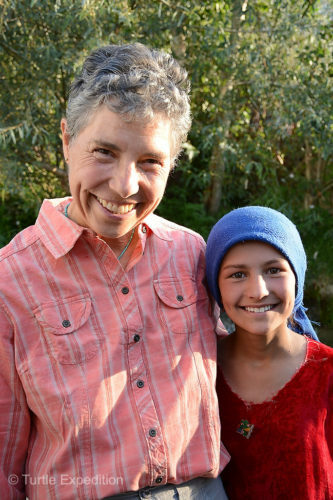 We now had a much clearer idea of where this young girl was coming from and the daunting change in her life that we were offering and imposing on her. At the age of eleven when we met, she did not have a dream of where the future would take her. We gave her unlimited choices, no doubt a little overwhelming at first. Now we watch how this adventure evolves. 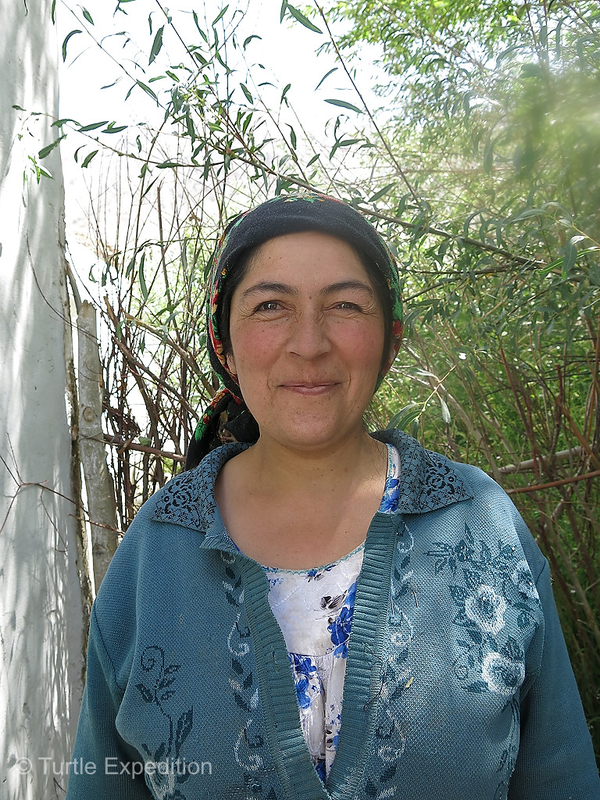 Her English is rapidly improving, thanks to additional classes and tutoring. With two and a half more years before she graduates in what is the equivalent of high school, her current aspirations of being a musician, an actress or a doctor may change more than once. We talk with her often by WhatsApp or Skype. 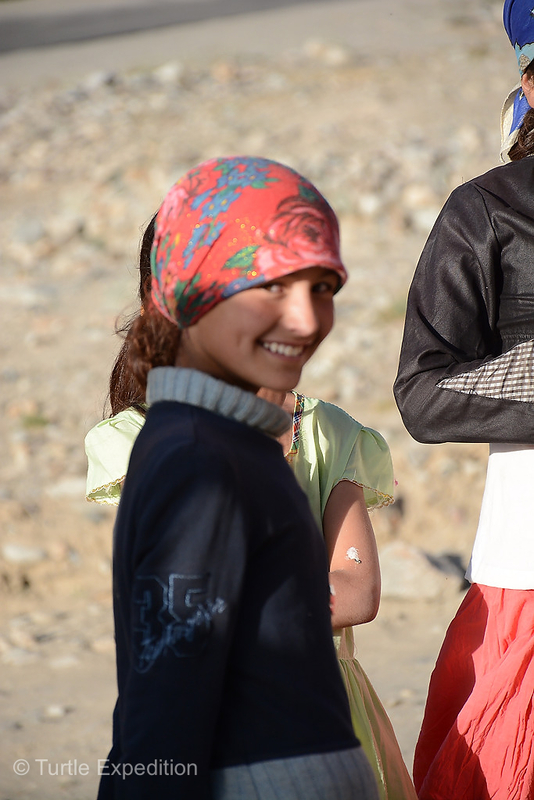 Our primary goal has been to keep her healthy and happy while she is learning, and to teach her the power of dreams. Masha is wearing a traditional Pamiri cap. Men and women seem to wear the same. 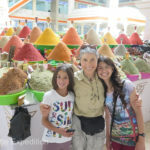 Before we left Tajikistan we took her and Sheroz’s niece to Dushanbe, the modern capital of the country. 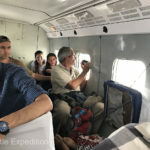 It was their first travel by airplane. We had fun spoiling them. It was a new world of museums, zoos, shopping malls, hamburgers, Baskin-Robbins ice cream, pizza, escalators, elevators, and even a 3D movie. Their own comfortable bed in a nice hotel with unlimited hot water was special. 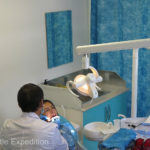 Masha also had her teeth cleaned by a professional dentist, all topped off by a manicure and a visit to a hair salon. 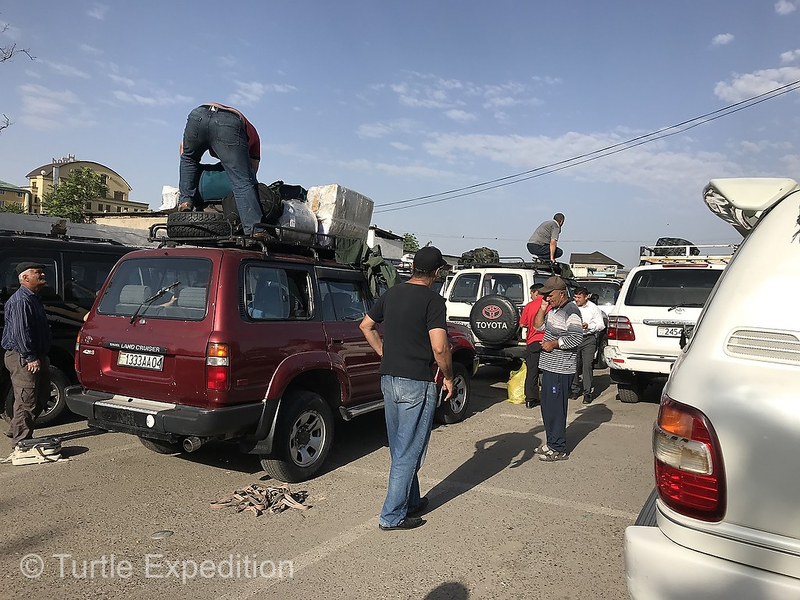 The two girls returned to Khorog by themselves, by the standard 14-19 hour 4X4 taxi into the mountains. Their minds no doubt swirling with impressions from another world. For the time being, we are taking care of all her needs. 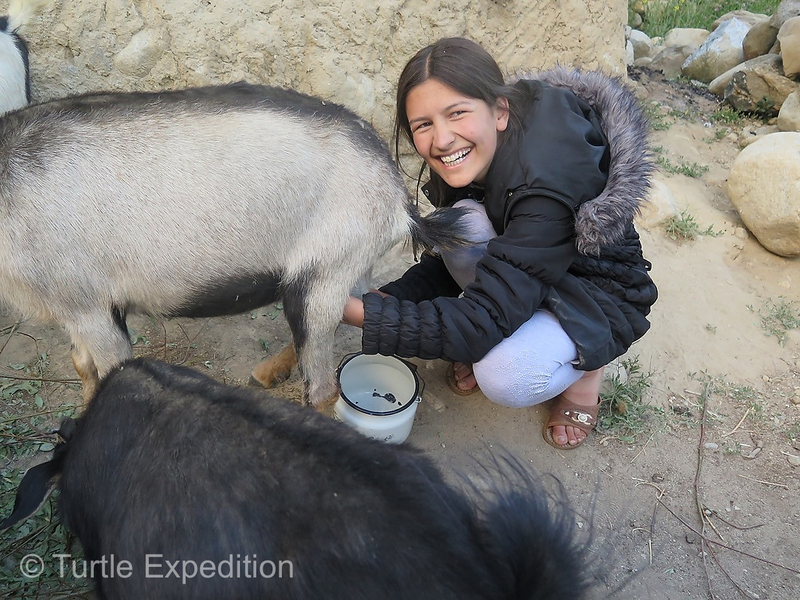 We know of other young girls and boys her age who have dreams of getting an education and could use your help, so if you are interested, send us an email, wescott@turtleexpedition, and put “Khorog Help” in the subject so it will not get lost in our junk mail. 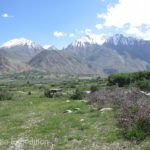 The average income in Khorog is about $100-150 a month and the tuition at Aga Khan Lycée school, grades 1 thru 9, is 460 TJS (Tajikistan Somonis) a month, which is $48. There are other expenses like computer, phone, internet, uniform, daily transportation, school supplies, etc. If anyone is interested, we can introduce you to another young person. On your part, it would be a person to person relationship with frequent conversations on Skype or WhatsApp. 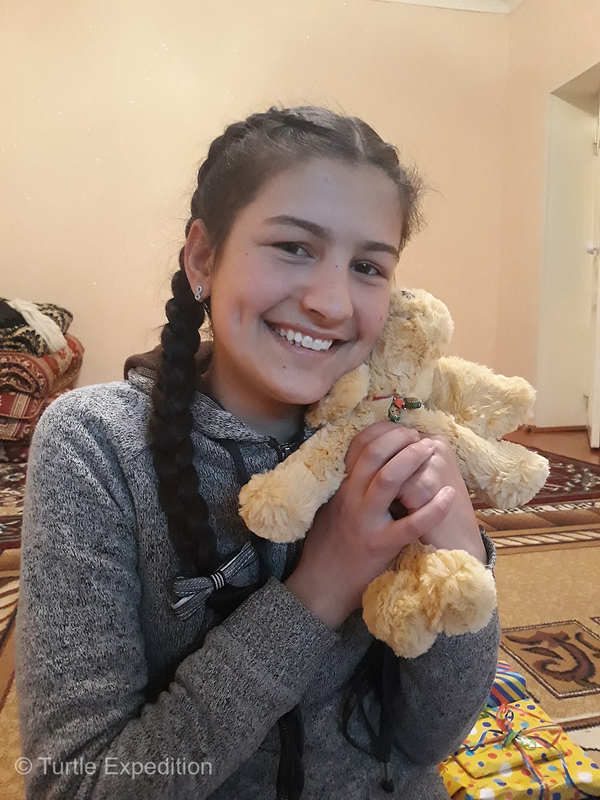 Our chance meeting of Masha and our ability to sponsor her (thanks to Sheroz Naimov who made it all possible) and watch her learn and grow has become one the highlights of our lives. 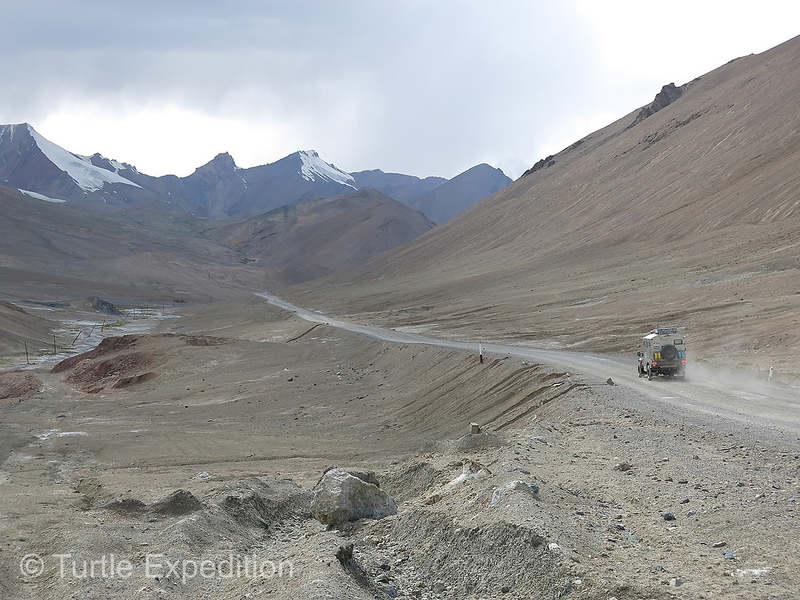 The dusty Pamir Highway was equally as rough in places as the Wakhan Corridor had been. 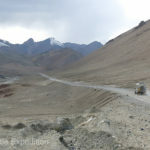 With passes well over 15,000, it is not hard to imagine you are driving on “The Roof of the World”. Afternoon is time to bring in the goats for milking. This was the entrance to Masha’s village. 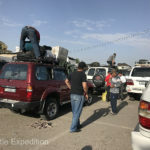 Our truck can be seen in the background. 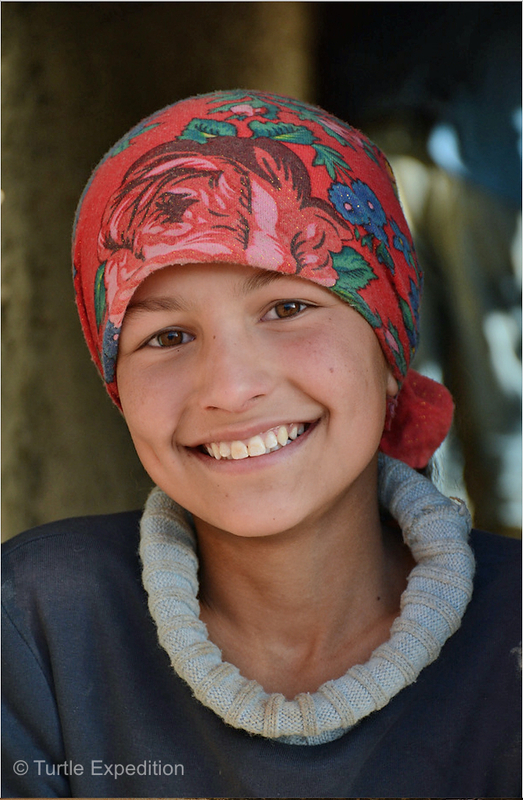 Masha’s smile and her inquisitive eyes captured our hearts from the moment we met. 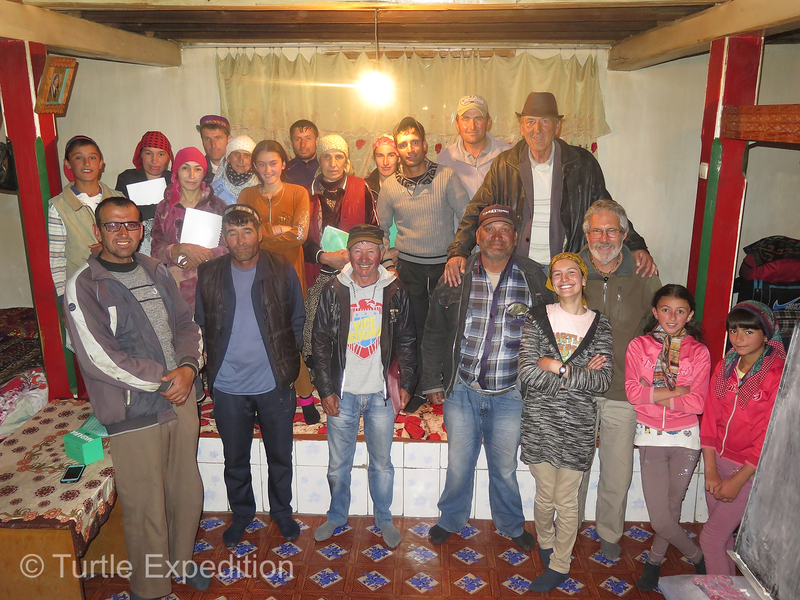 Our camp near Masha’s village was the perfect place to meet her family without intruding into their lives. Masha’s mother always had a smile. She confided to Monika in Russian that she knew Masha was special. Sheroz Naimov was the key to reconnect with Masha. His father and sister also offered her their home so she could attend the Aga Khan Lycée in Khorog. Mom is stoking the cooking stove fire. 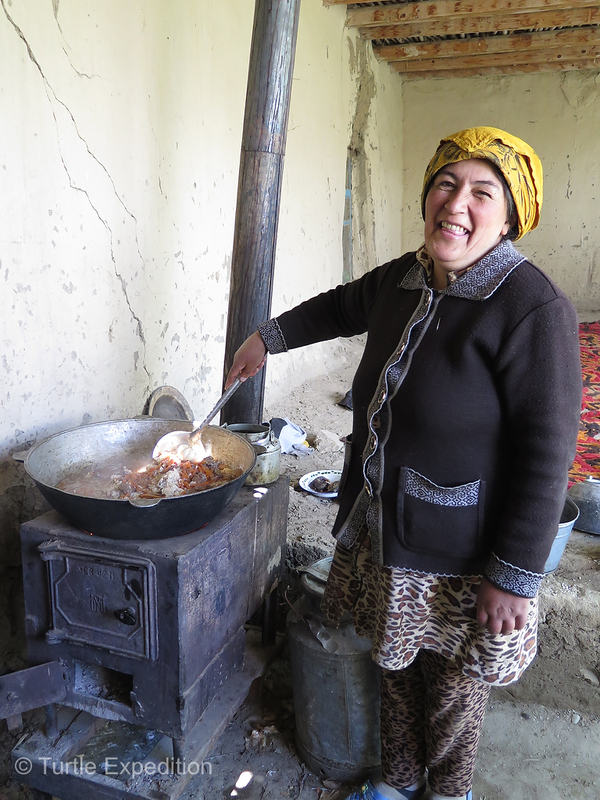 Cooking at Masha’s home is done on an old metal stove in an outside porch. 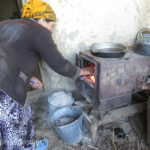 The small stove is moved inside in winter and may be their primary source of heat. 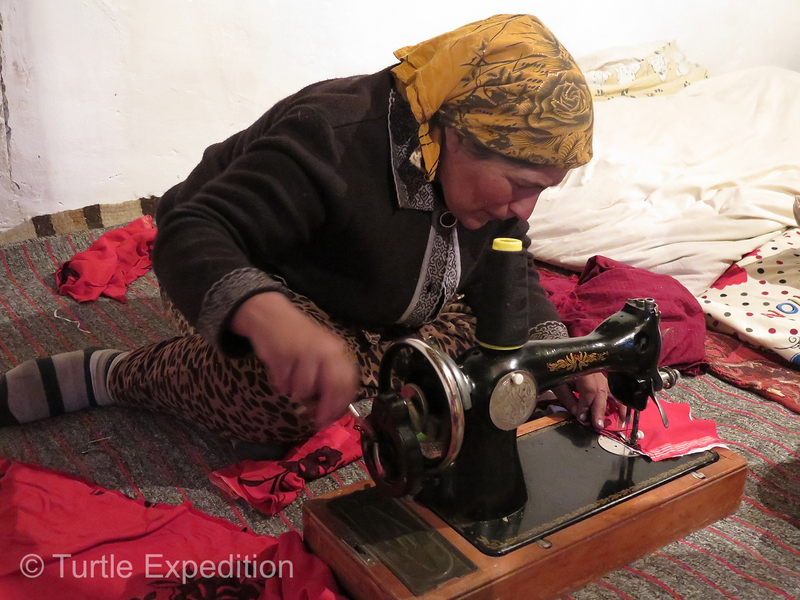 Masha’s mother sews many of her children’s clothes on a hand-crank sewing machine. Every once in a while mom would stop to feed the sewing machine some oil for lubrication. 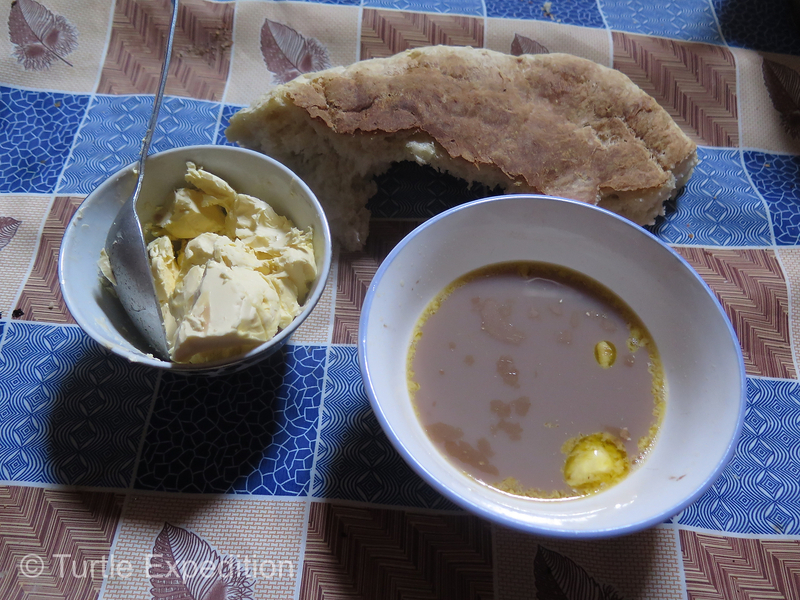 A traditional Pamiri breakfast is black milk tea with a touch of butter and homemade bread. Black milk tea and bread. Breakfast is very simple and the same every day, 7 days a week. Bread is baked daily in a rickety Russian electric oven, clearly on its last leg. 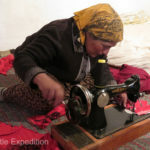 Clothes are all washed by hand the old fashioned way. 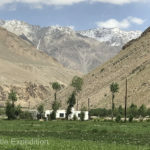 Surrounded by snow-clad peaks of the Pamirs, the “village” is more a community of homes in-between potato and grass fields laced with a web of small interconnected irrigation channels. 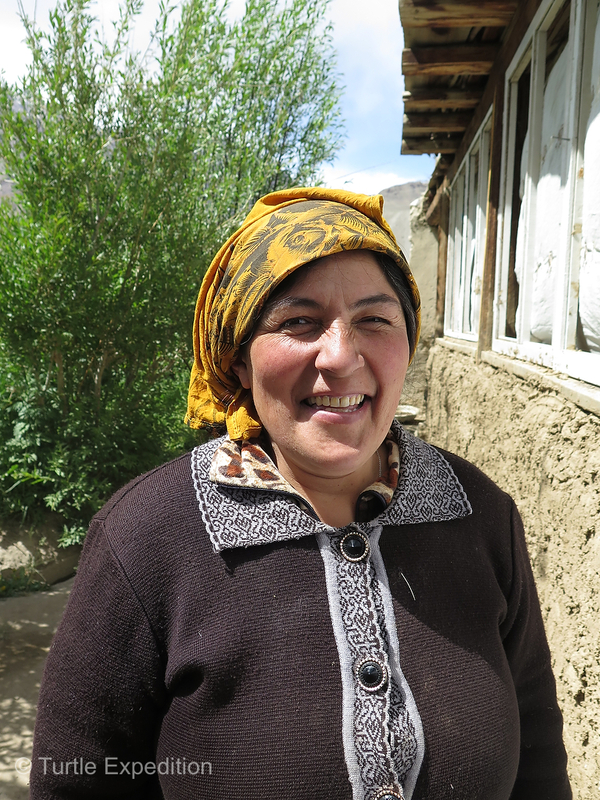 At an altitude of 10,000 feet, Masha’s family only grows potatoes, carrots, and wheat. No fruit trees and no vegetable patches. 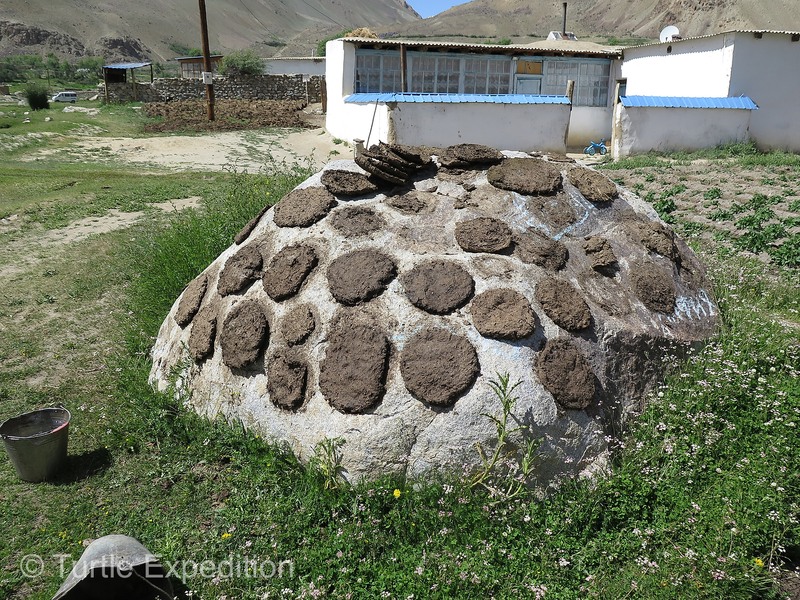 Animal barns are very simple, often made with stacked rocks and mud for mortar. 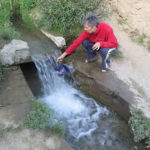 The network of irrigation channels connects most homes to the mountains and the year-round snowmelt. 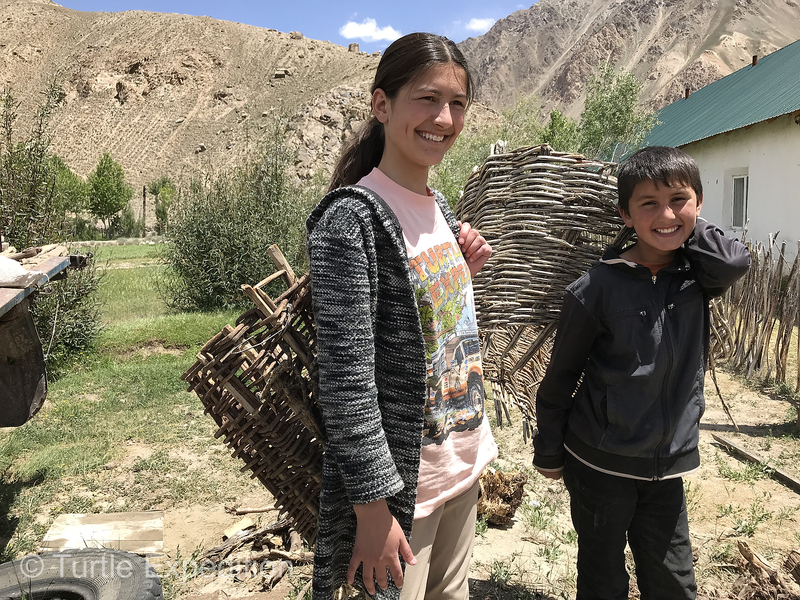 Masha and her cousin are demonstrating hay carrying baskets. We filtered all of our personal drinking water with an MSR Guardian Purifier System that removes all protozoa, bacteria, viruses, and particulate. 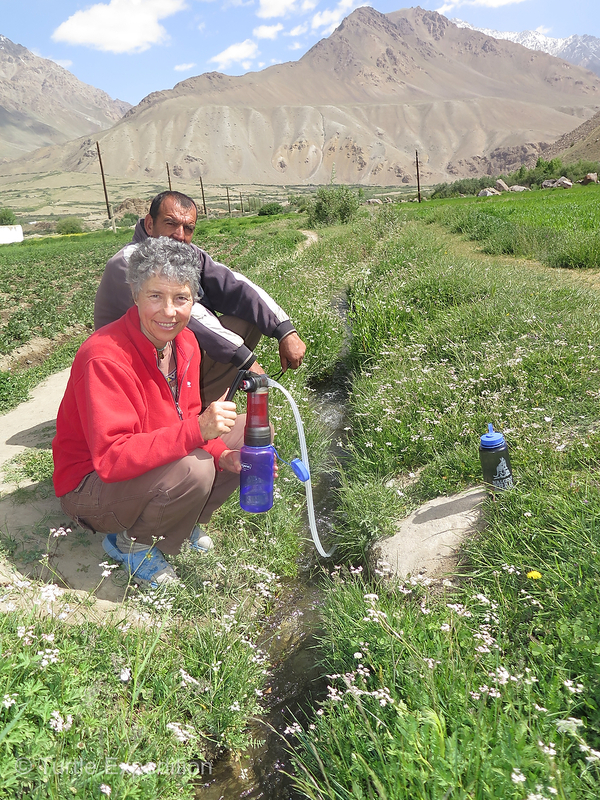 Monika pumps from an irrigation ditch. 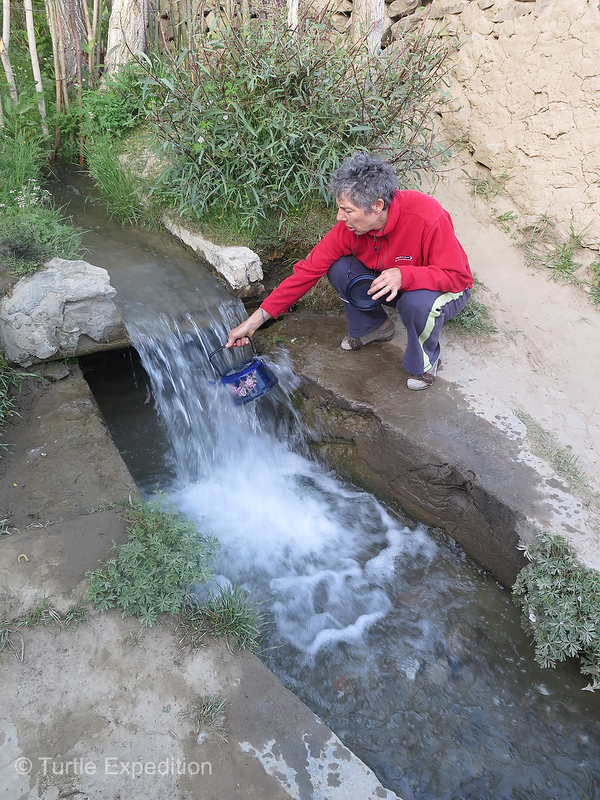 All water for cooking, washing and tea or coffee came from the irrigation ditch in front of the home. Monika fills a tea pot. We were honored to be invited to one of the community prayer evenings. 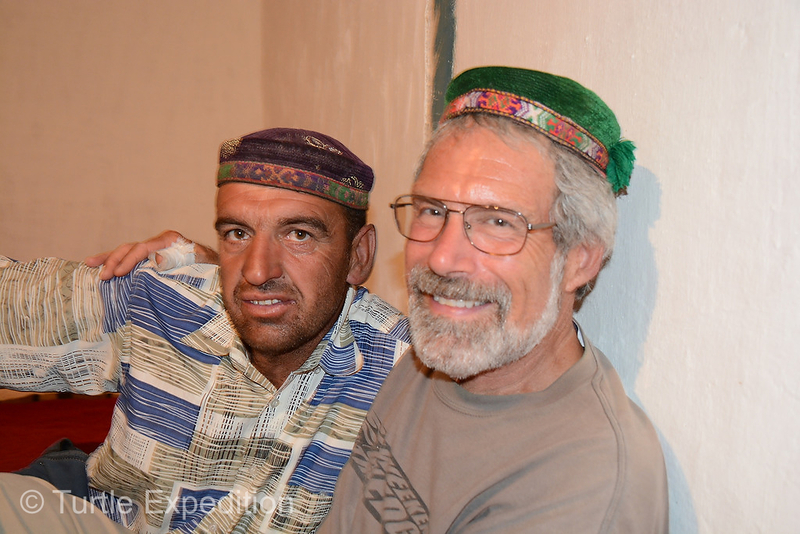 The fact that we were not Muslim did not matter to these members of the Shia Ismaili faith. 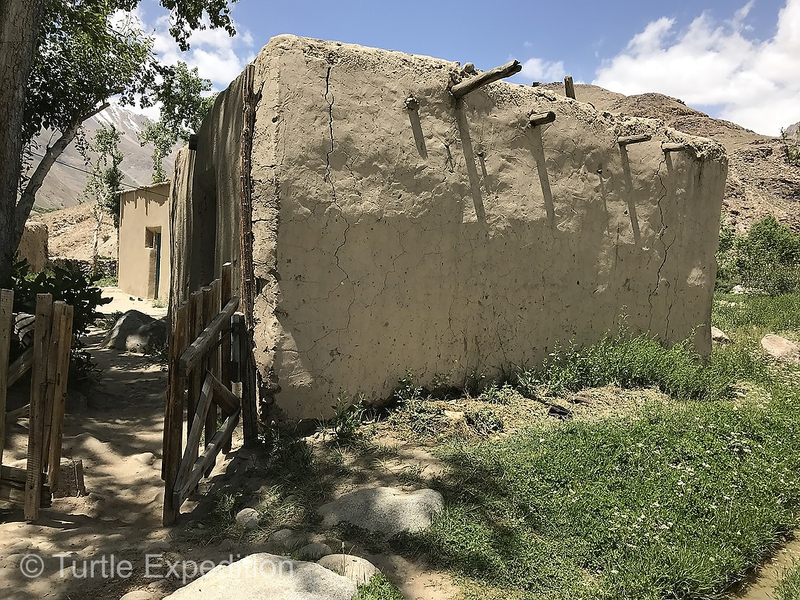 The “outhouse” at Masha’s home was a precarious assembly of old boards and sticks on the side of the hill next to the goat barn. 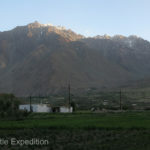 The majestic mountains surrounded the open valley. 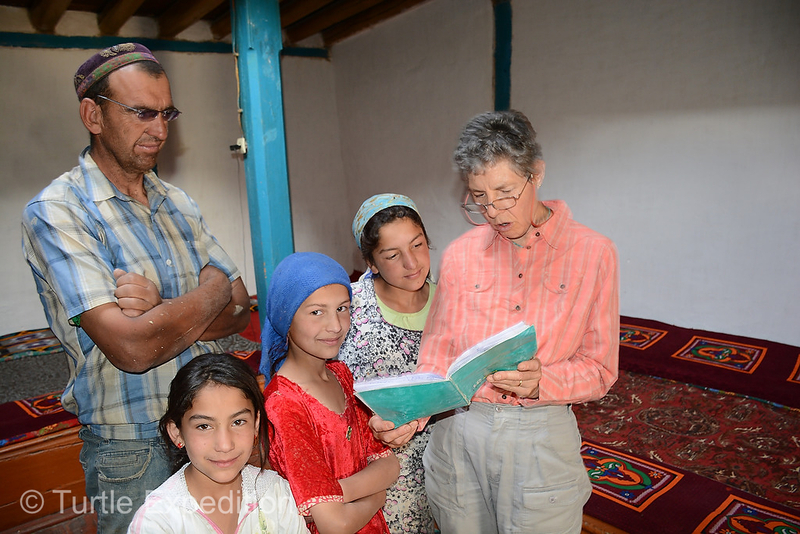 As honored guests we visited several homes of relatives of Masha’s family. They always put out their best spread, sometimes with homemade preserves and plates of candy & cookies that had to be bought in town. 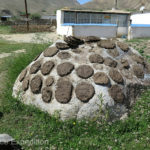 The drying of cow, sheep and goat dung is an important summer chore. 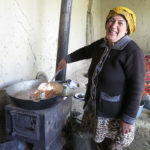 In the winter, it may be the only source of heat for cooking and warmth in addition to the small amount of wood they can gather in this almost treeless land. 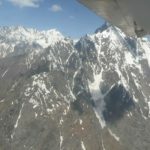 How to get to Khorog from Dushanbe if the planes are grounded? 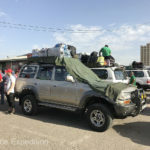 Load your gear on top of a Toyota Land Cruiser taxi and hang on for an exciting and tiring 14-19 hour ride. 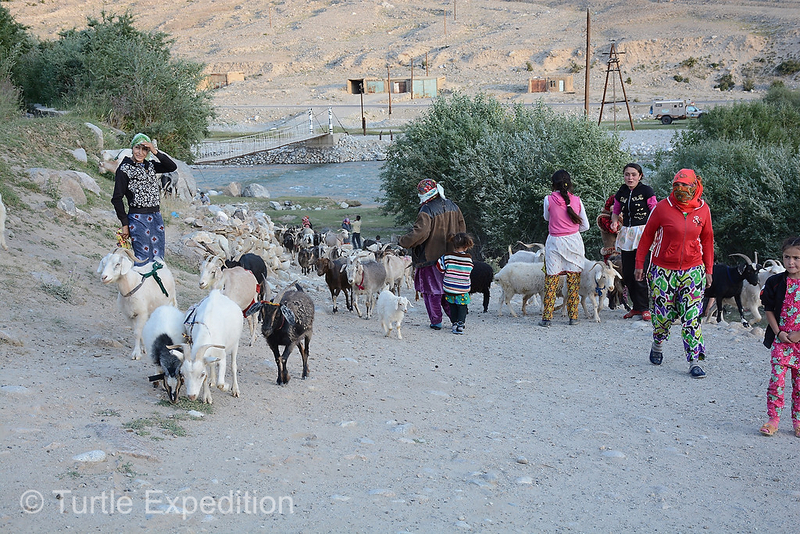 The narrow dirt road to Khorog can be exciting because you often have no idea of who is coming around the corner. 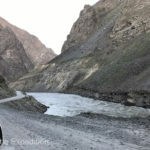 Afghanistan is just across the river. 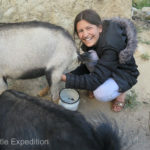 Masha’s ability to transition from herding and milking goats to a city life and a very demanding education program was remarkable. Yes, she still knows how to milk goats! 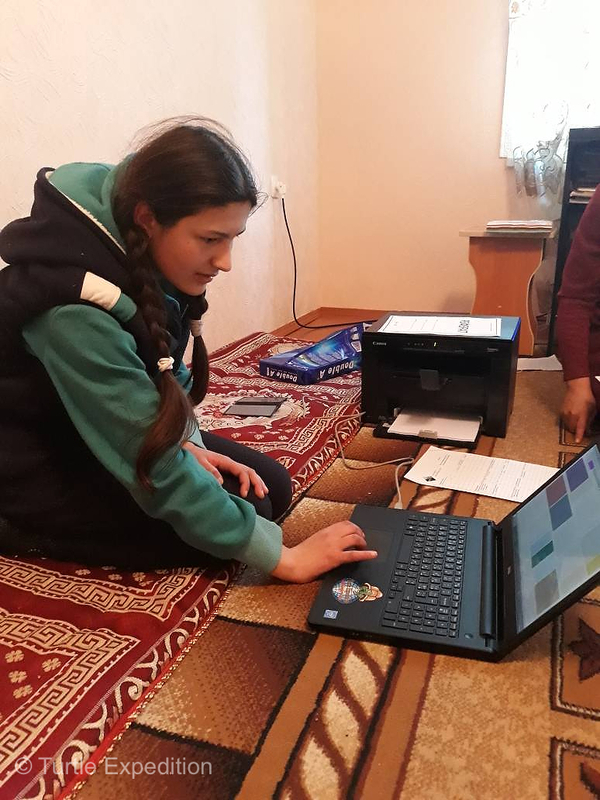 Homework is a daily priority, and with 17 classes a week which includes Tajik, Geography, Biology, Art, Tajik History, Algebra, Literature, English, Chemistry, Physics, Technology, Physical Education, History, Computer Science, Ecology, Russian and Religion. 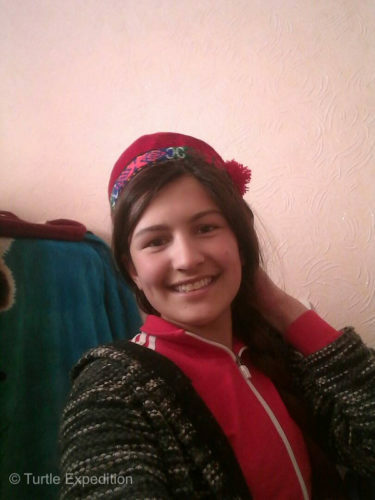 Masha’s transition into becoming a student and a teenager in the city has been remarkable and rewarding for both her and us. 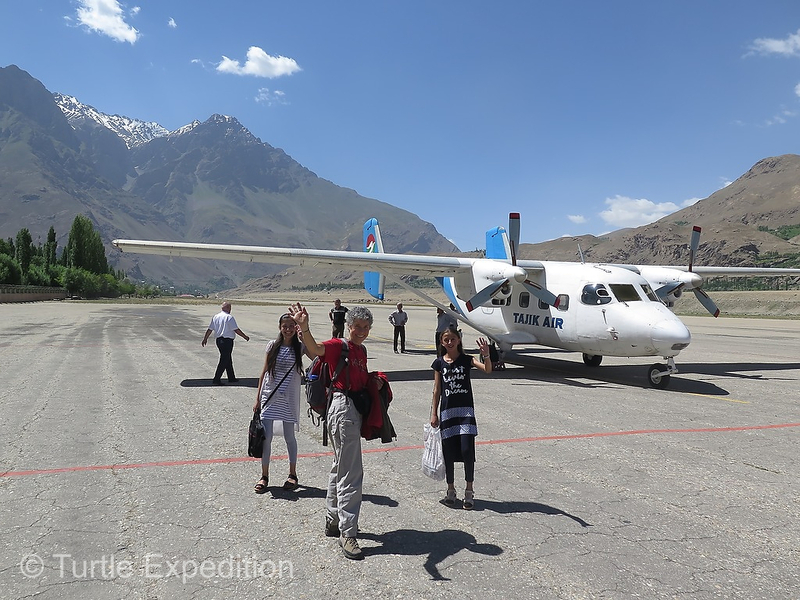 It was Masha’s and her friend’s first flying experience. 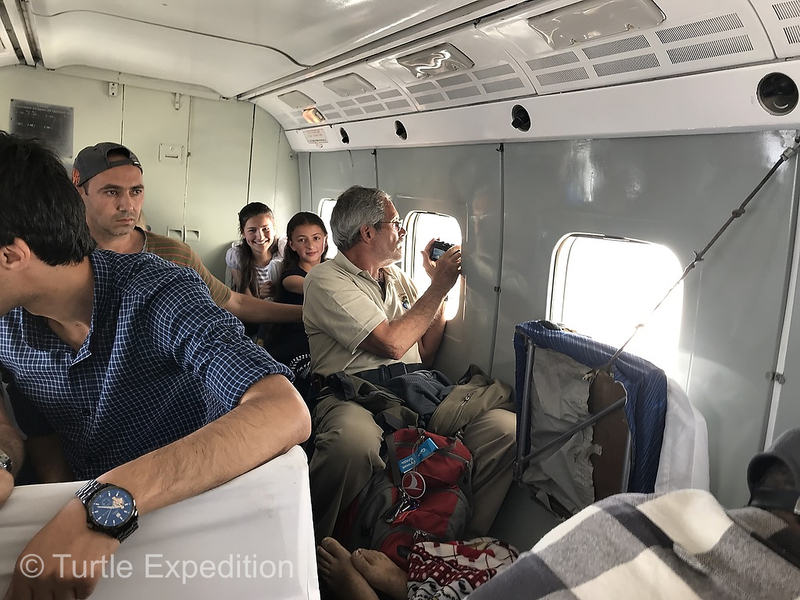 The 16-seat passenger plane was full and included a very ill young man on a stretcher. 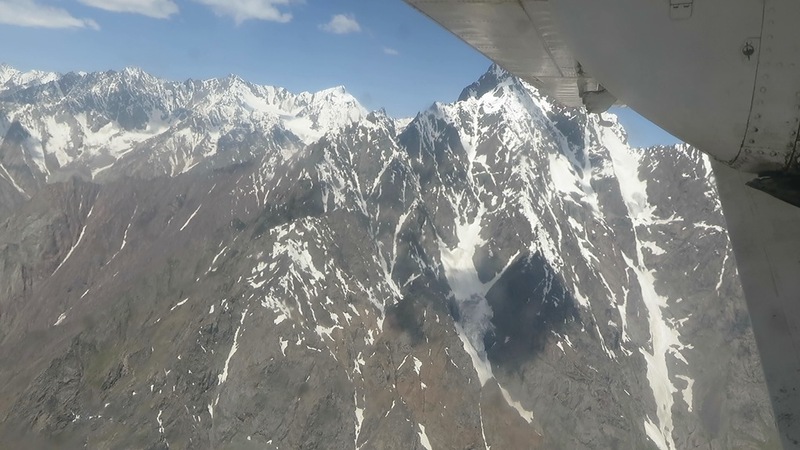 As the plane maneuvered through the 22,000 foot peaks of the Pamirs the view was spectacular. First time in a dental chair to have her teeth cleaned. 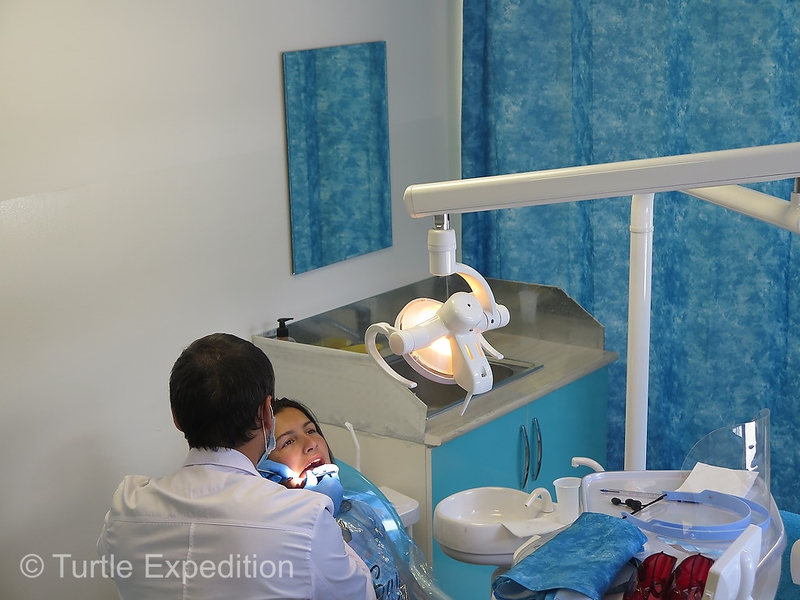 There was no good dentist in Khorog but we found one in Dushanbe. 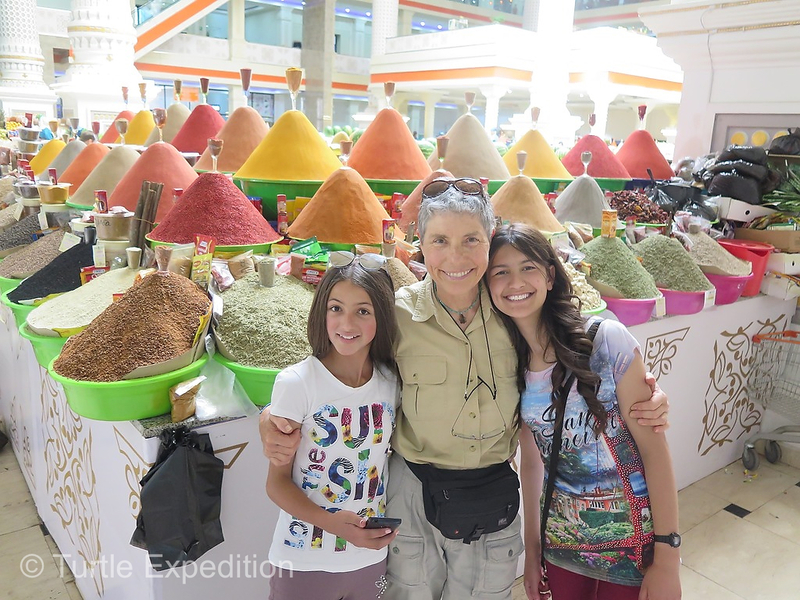 The colorful spice section in the main Dushanbe bazaar is always good for a selfie. 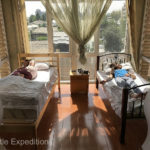 A comfortable bed in a nice hotel and a big shower with unlimited hot water was a treat for both Masha and her friend. A visit to a professional beauty salon for a manicure and a hair trim was on the list of special treats for Masha’s first big city experience. During our three days at Masha’s home those inquisitive eyes always caught ours. Did she know what she was doing? As we left Masha’s village she was the only one who asked to sit in Monika’s seat. A dream of someday coming to California was already growing, and before we arrived, she didn’t even know where California was. Her transition from an innocent 11-year-old to a beautiful modern teenager was amazing and a little scary. 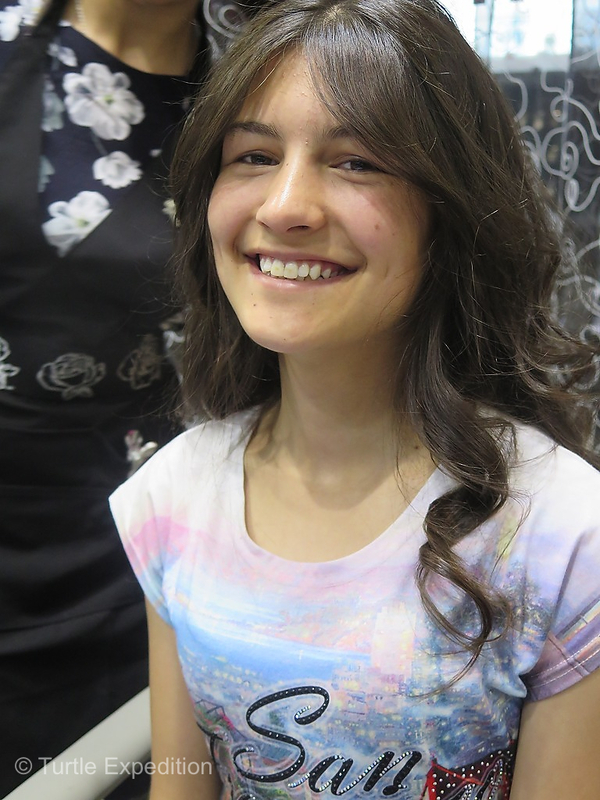 Having straight hair, she thought it cool to have curls for a change. Masha is sporting a traditional Pamiri cap. Men and women seem to wear the same. 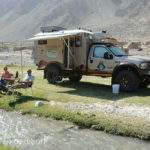 Tags: 4x4 Travel Adventure, Aga Khan Lycée, Gary Monika Wescott, Khorog, Overlanding, Pamir, Tajikistan, The Turtle Expedition Unltd. 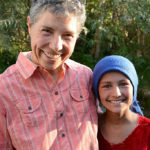 Monica and Gary – Bless you both for helping this wonderful young girl to a life many only dream of. This is so very cool that you have been able to give in such an incredible way. 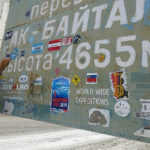 It will be interesting to learn what direction Masha’s education will take her. Wow, Monika & Gary! What an inspiring and educational read this was. I can only imagine how thrilling it must be to offer so much to this beautiful young woman, but it’s equally wonderful the way that you’re teaching people like me about another culture, another WORLD, really. Many blessings to you both, as well as to Masha and her family.